Up to 98% AFUE Modulating VS ECM Multi-Position Gas Furnace These TP9C furnaces are compact units that employ induced combustion, reliable hot surface ignition and high heat transfer aluminized tubular heat exchangers. The units are factory shipped for installation in upflow or horizontal applications and may be converted for downflow applications. Designed and certified as Category IV furnaces, these CP9C models may be installed as direct vent systems through side wall or roof applications using approved plastic combustion air and vent materials. 100 Stage Modulating VS ECM Design. Compact 33” Height and Standard Cabinet Widths. Multi-Position Design With Minimal Conversion Requirements. Airflow Leakage Rate of Less Than 1% of Total Airflow @ 1” ESP. ECM Variable-Speed Motor with Large, Quiet Blower. Fully-Supported, Slide-Out Blower Assembly for Easy Service Access. High-Level Self-Diagnostic Controls With Fault Codes. Sharp Edges Eliminated By Folding and Flattening the Sheet Metal. Fully-Gasketed, Independent Access Doors W/View Ports, Retail Appearance. External Air Filters (Not Included) Provide Flexibility for IAQ Needs. Patent-Pending Condensate Management System Eliminates the Need for External Condensate Traps. *Must be registered online within 90 days of installation. Otherwise, the warranty reverts to the standard warranty as published in the product warranty certificate 80% Modulating ECM Multi-Position Gas Furnace These TPLC residential gas furnaces are the only modulating 80% AFUE residential gas furnaces designs available today. This unique, compact unit design employs induced combustion, reliable hot surface ignition and high heat transfer aluminized tubular heat exchangers. The units are factory shipped for installation in upflow, horizontal, or downflow applications. 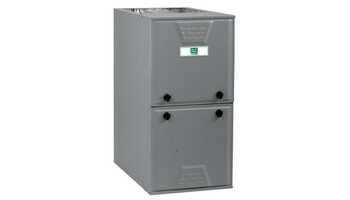 These CSA certified and approved furnaces are Category I listed and may be common vented with another gas appliance as allowed by the National Fuel Gas Code. Tubular Aluminized Steel Primary Heat Exchanger. Fully-Gasketed, Independent Access Doors With View Ports and Attractive Retail Appearance. All Models Are Propane Convertible. All CPLC models meet Lo-NOx Code Requirements.